This morning when I took the garbage out to the curb, I carried along with it one worn out knobbie tire from Kenny’s KTM. As I stood it next to the garbage can, it seemed to me that there was some life in the old girl yet. Maybe not for riding, but for something. Luckily, I retrieved it before the garbage men came. I wiped it off, made a bow and hung it up in a tree out front with a festive red tie down. Then I added a few battery powered lights and VOILA! 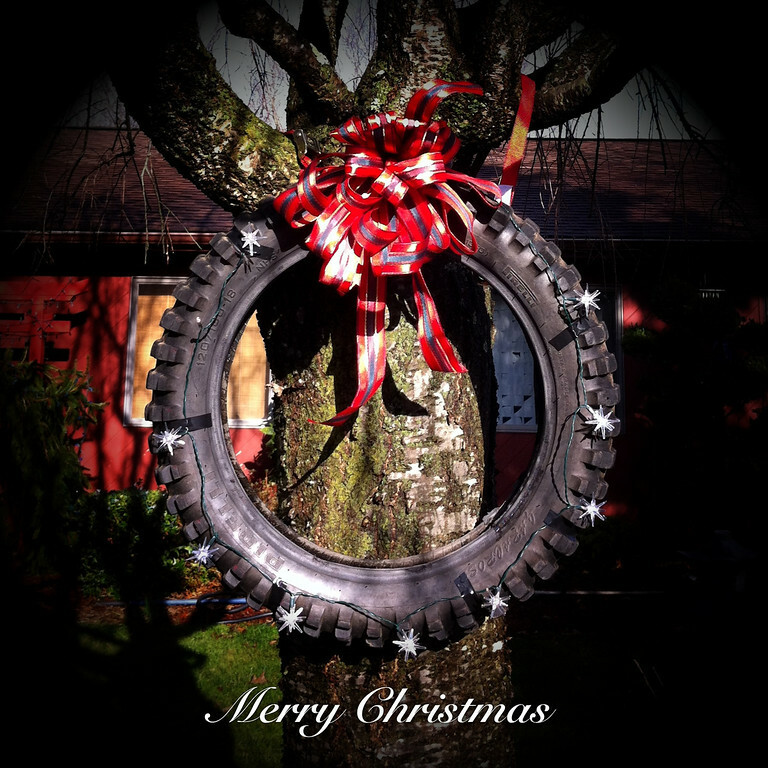 A very Merry moto-Christmas wreath. Sending you a big hug across the miles. Merry Christmas, Happy Hanukkah and many blessings to you and yours. True spirit of Christmas? A celebration of something small and beautiful. The birth of a child. Picking up something dejected and abandoned and bringing new life to it says more about Christmas than any fancy, flashy, expensive gift could. You’re a freakin’ superhero Fuzz’. I LOVE it … and that pic would make a most excellent Christmas card next year! I hope you and MR. RW have the Merriest Christmas. Wonderful idea! And Merry Christmas! I also think that it would make a great card…. Thanks, Richard. Merry Christmas to you. Wishing you many happy miles in 2012. Clever, funny and awesome. What we’ve come to expect from our favorite blogger. I equally like to tweak my staid neighbors who sit on their front porch and scratch their heads watching me get on the bike in crazy weather. Merry Christmas, R. I know 2012 has much joy in store for you. +1 on the Christmas card…looks great. Merry Christmas. Hope to see you SOON! Merry Christmas from New Zealand and here’s to many great rides in the New Year! Merry Christmas, Andrew! Wishing you miles of smiles in 2012! I bow down to your creative awesomeness. Simply brilliant. And here I’ve been wondering what to do with our old moto tires since our garbage company will not pick them up. Happy Holidays from the west coast. Thanks for the great idea! I can take all my old tires, tie a bow on them and give them away to friends for the holidays and save myself the disposal fee… the gift that keeps on giving. IF you do make some, please share pics on your blog! Well I guess when i replace the DRZ rear in a couple of days I can decorate it and save it for next year. This is a great idea! Merry Christmas to you and everyone else as well! I love it, but thats from a guy with two bikes in the dining room. Merry Christmas. Awesome. And very Fuzzy-like! I hope your Christmas was grand! Fuzzy! Belated Merry Christmas! Love the wreath, that is very cool and cute! Now I know what will be hanging on my gate next year! Happy New Year filled with moto blessings!